I used this contribution from the Muni Archive for a now-then feature in the Times back in 1998. (Well it would not be forward in 1998, I know, but the more needless words one uses the more time there is to think and even relax in between the meaningful ones.) The date is hand written below the clipping that follows. Remember please, don’t stop with one click, CLICK TWICE ENLARGE. This is in response to Ben Lukoff’s question about the possible existence of other Van de Kamp’s windmills. He also found one in the Roosevelt district and includes a link to it. It too no longer turns in the wind. 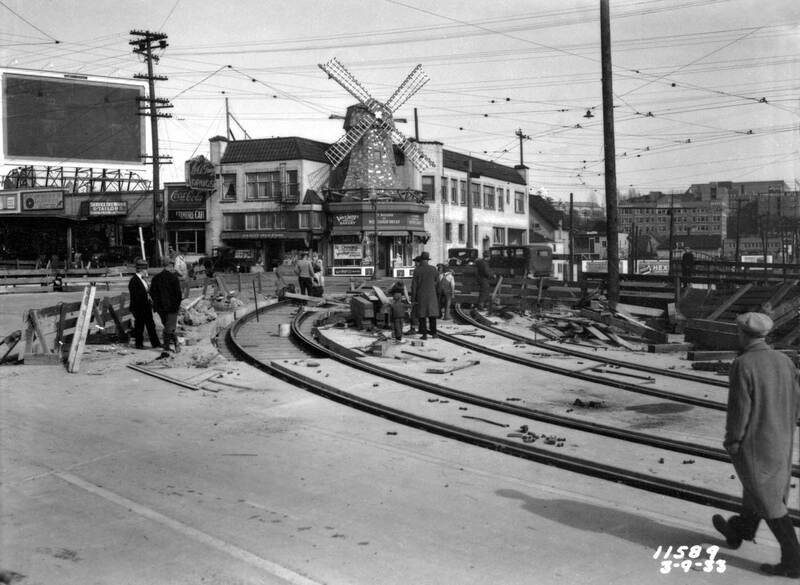 I remember small Van de Camp’s sections in some supermarkets but no more big windmills when I arrived here in the mid-1960s. 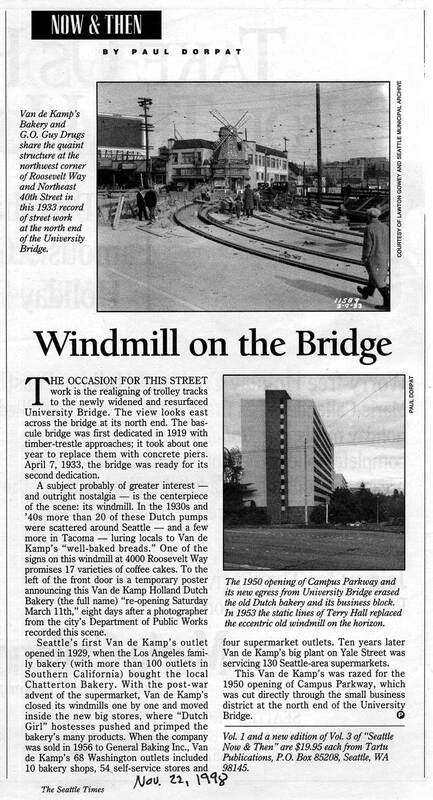 Read on for some description of what happened to this windmill near the north end of the University Bridge. Tilting at windmills now, are we? I lived in Terry Hall in the ’80s, on the top floor and the nearest corner in that photo above. I had no idea that there had been a Van de Kamp’s on that site. You learn something new every day if you’re not careful. What a shame the parkway was never used for its intended purpose.